I’ve only made dinner on major holidays maybe twice in my entire life and it was always for myself. This year I wanted to cook for family. It’s always seemed like a great idea to make a huge feast for my family and other relatives until I think about all of the prep work and actual cooking I’d have to do. I’m sure I’ll work my way up to that, but for now, I’ll settle for cooking a meal big enough for my mom and I, my grandmother and my delightful cousin. 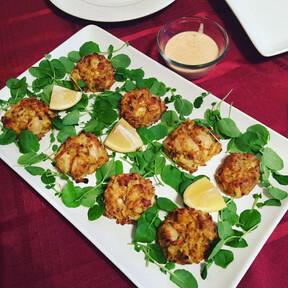 On Easter Sunday, I served baby crab cakes with a homemade remoulade sauce as an appetizer. 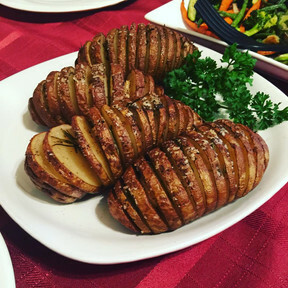 For our main course we had pot roast, garlic and rosemary hasselback potatoes, and roasted vegetables. For dessert, we had a rich triple chocolate mousse cake courtesy of PBS’ America’s Test Kitchen cookbook. It was a lovely feast and my family enjoyed it all! If I hadn’t made the cake, I could’ve had this meal done in just a few hours. But since it was my first time making any kind of mousse cake, let alone a triple chocolate one, I took my sweet time. If you don’t yet, check out America’s Test Kitchen’s recipes. They’re foolproof and have been tested at least a dozen times. You can’t go wrong with their suggestions and recipes. 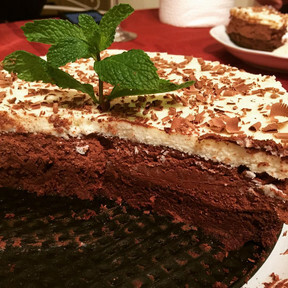 For the triple chocolate mousse cake recipe, go to their website: https://www.americastestkitchen.com/. Other than the cake, this dinner was very simple to make. It just requires a bit of prep work with the potatoes and vegetables, but once that’s over, you’re good to go. Honestly, the easiest part of this meal is the pot roast, and I got my cut of beef from a local butcher shop for the first time. Anyway, on to the recipe! 3. Add the old bay, garlic powder, crushed red pepper, salt, pepper, parsley and crackers and combine the mixture. 4. Cover and refrigerate for at least an hour. You can also make this the night before. 5. Scoop the crab cakes into 1/4 cup cakes and place onto a baking sheet with parchment paper. This is enough for about six crab cakes. 2. Season generously with salt and pepper on both sides. 3. Sear on both sides in the olive oil for 3-5 minutes each side until browned. 4. 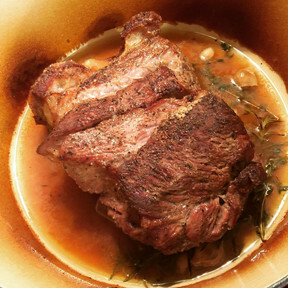 Pour 1 cup of beef broth into the dutch oven and add the garlic cloves, thyme and rosemary. 5. Cover the dutch oven and place it into the oven. 6. Roast for 1.5 hours. 7. Remove from the oven, let it rest for 10-15 minutes before serving. You can also keep it warm in the oven or on the stove top over low heat. 1. Slice along the width of the potato, without slicing all the way through. The potato should resemble a fan. 2. Alternate along the slices and stuff with fresh garlic and rosemary. 3. Place potatoes on a baking sheet with parchment paper. 4. Drizzle olive oil and season with salt and pepper. 5. Place in an oven heated to 400 degrees. 6. Roast for an hour or until the entire potato is tender. Serve with sour cream or your favorite potato topping of your choice. 1. Slice the carrots and zucchini in halves and then slice them long ways. 2. Slice the onion into 4-6 parts. Keeping the onions as thick slices will make sure they don’t cook too quickly and burn and will allow them to cook evenly with the other vegetables. 3. If you have frozen broccoli and green beans, make sure they’re thawed and patted dry before putting them into the oven. 4. 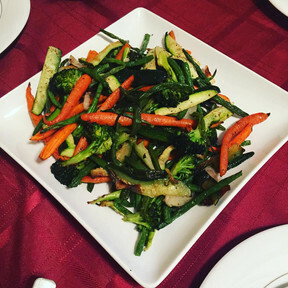 Toss the vegetables in 1 tablespoon of olive oil. Season them with garlic powder, salt and pepper. 5. Place them on a baking sheet with parchment paper and place them into an oven heated to 400 degrees. 6. Roast for 45 minutes or until slightly browned. I hope this recipe worked out for you! Let me know how it turned out for you and your family. Comment below and let me know what changes you made too! Also, if you have two ovens and were able to make this meal in two hours or less, lucky you. I totally could’ve used two ovens on Sunday. Look out for my next post next week! It’s starting to feel like spring outside, so I’ll be writing about my favorite herbs to grow and cook with. Warm weather is all about fresh ingredients to me. I’m excited to share it with you all!